A fountain at a major intersection quotes his writing. A community garden is named for one of his characters, played by Frank Sinatra. But what do you really know about Nelson Algren in East Village? Chicago Tribune transportation writer Mary Wisniewski is here to help. She visits the East Village Association on Monday to tell the tale of Algren's days and nights on Division Street. Wisniewski's biography Algren: A Life, published by Chicago Review Press, is a fine Christmas gift for East Village neighbors and friends who drop by to visit Algren's Gold Star barstool. As usual, we'll meet in a tavern, The Happy Village at 1059 N. Wolcott. The program starts at 7. The agenda includes Ald. Proco Joe Moreno on the State of the 1st Ward, Bridgette Flagg of Soule Restaurant, 1931 W. Chicago Ave., and an update on development at the Polish Triangle, where Algren's quote appears (“For the masses who do the city’s labor also keep the city’s heart”). East Village was Algren's 1930s haunt as a struggling writer. 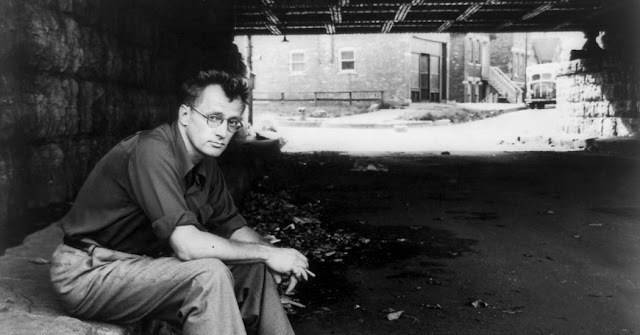 "Algren had a fine ear for the nuances of Chicago Polonia dialect," says the New York Times review of Wisniewski's book. The working-class Polonia that gave way to East Village was raw material for Algren short stories and novels such as Never Come Morning, which brought on a feud with the Polish Roman Catholic Union of America. The Sinatra vehicle The Man With the Golden Arm inspired a sunnier response: EVA organized the Frankie Machine Garden at 1800 W. Haddon St., which next year celebrates its 30th anniversary.